Evidently, Stieg Larsson’s popular trilogy of books The Girl With the Dragon Tattoo, The Girl Who Played With Fire, and The Girl Who Kicked the Hornet’s Nest have inspired a plethora of title copycats. NINETY-ONE title copycats as per a recent count that have used a similar title since 2010 when The Girl With the Dragon Tattoo became an international sensation. This raises an interesting and common copyright question regarding the copyright protection vested in the TITLE of a copyrighted work. Does Copyright Protect The Title of a Work? In the US the short answer is NO. US Copyright Law does not protect titles, names, short phrases or expressions. Even if the title is original or distinctive it cannot be protected by copyright. Entirely different works can have the same or a similar title. This may seem counter intuitive; since, US Copyright Law does protect “original works of authorship” in the form of literary, musical, pictorial or graphic expression. However, titles, names and other short phrases do not meet the requirements for copyright protection. (Some names and short phrases can be protected by trademark). Back to the 91 title copycats who have recently published books similar to the titles of Larsson’s popular Girl With the Dragon Tattoo series. A few of my personal favorites of the copycat titles are: The Girl With the Thistle Tattoo; The Girl With the Sandwich Tattoo; The Girl With the Iron Touch, The Girl with the Golden Parasol; The Girl With the Brave Heart and The Girl With Chipmunk Hands. (All can be purchased on Amazon… target difference age ranges and cover a wide range of topics). For more information see, Circular 34: Copyright Protection Not Available For Names, Titles and Short Phrases published by the US Copyright Office; The Title With The 91 Imitators by H. O’Neill in New York Magazine; earlier posts “How to Write a © copyright notice and why to use it?” and “Copyright Protection Only Costs $35“; @iplegalfreebies and www.kasterlegal.com. A lawsuit over the FREE USE of the Sherlock Holmes characters and story elements prompted the US District Court in the Northern District of Illinois to do some detective work into the famous, fictional detective to determine whether Holmes, other characters and story elements of Sir Arthur Conan Doyle’s books and stories had entered into the public domain. The lawsuit, Klinger v. Conan Doyle Estate, raises two interesting copyright questions: 1) what are the copyrightable elements of a literary work; and 2) when do copyrightable elements of a literary work enter the public domain and become available for free public use. As a bit of background info, Sir Arthur Conan Doyle authored four novels and 56 short stories featuring Sherlock Holmes and Dr. Watson and published these in the US over a span of 30 years (from 1890 – 1926). As one might expect, new characters and plot elements were introduced in the novels and short stories over time. Hint: these details are critical to the court’s analysis of the copyright questions raised in the case. QUESTION 1: Copyrightable Elements of a Literary Work. The court held that copyright protection extends to characters, character traits, and storyline because these are copyrightable “increments of expression.” By contrast, the court reiterated a general tenant of US copyright law that “ideas, plots, dramatic situations and events” are not elements in a literary work that are protected by copyright. QUESTION 2: When Do Copyrightable Elements of Sir Author Conan Doyle’s Literary Works Enter the Public Domain and Become Available For Free Public Use? The short answer is that his works published prior to 1923 are in the public domain. Since Sir Author Conan Doyle published works featuring Sherlock Holmes and Dr. Watson both before and after 1923, the court analyzed the publication dates of the works and the introduction of various copyrightable “increments of expression” (including characters, character traits and storyline) to determine which were published pre-1923 and post-1923. Those published pre-1923 are in the public domain and those published post-1923 are still protected by copyright. Interestingly, some of the post-1923 characters, character traits and storylines that were at issue in the lawsuit and held by the court to be still protected by copyright are: 1) Dr. Watson’s second wife (introduced in 1924); 2) Dr Watson’s background as an athlete (introduced in 1924); 3) and Sherlock Holmes’ retirement from his detective agency (introduced in 1926). Only 10 of Sir Author Conan Doyle’s works featuring Sherlock Holmes and Dr. Watson were published in the US post-1923 and are still covered by copyright protection. The 50 earlier works are in the public domain, which means that “increments of expression” including characters, character traits and storyline (most notably Sherlock Holmes and Dr. Watson) are available for the public to use for free without a license. This summary is based on the Memorandum Opinion and Order issued by the United States District Court for the Northern District of Illinois in a ruling on the plaintiff, Klinger’s, motion for summary judgment against the Conan Doyle Estate. 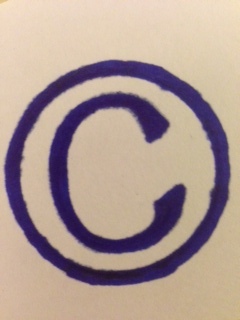 See also: earlier blog posts on the topic of “public domain,” https://iplegalfreebies.wordpress.com/category/public-domain/; other copyright and public domain resources, http://www.copyright.gov, http://copyright.cornell.edu/resources/publicdomain.cfm, http://creativecommons.org/publicdomain/; @iplegalfreebies and www.kasterlegal.com. It’s possible to print in 3D by scanning an object to create a 3D model file… and then printing it with a 3D printer (be careful not to infringe a copyright, trademark or patent in the process). The ability to scan an object with a laser to create a 3D model file is particularly interesting to me, because, it opens up a new dimension of (potential) intellectual property infringement. For example, scanning and printing someone else’s original jewelry design could be copyright infringement. 3D printing is an additive process by which incredibly thin layers of material are ‘printed out’ and built up to create a three-dimensional object. This is accomplished by using 3D model files to provide 3D printing instructions to 3D printers. As you might guess, 3D model files can be generated in several ways including: 1) scanning an object, 2) using design software to create a design from scratch and 3) re-designing a scanned image by using design software. For example, it would be possible to scan an engagement ring and scan a family pet and combine the two scans to replace the ring’s center stone with a miniature image the beloved pet. (Perhaps not an example of something folks are rushing to do… but you get the idea. The possible infringement comes into play if scanning and reproducing an object infringes a copyright, trademark or patent, like a copyrighted jewelry design). The 3D scanner that I saw in action involved a slowly rotating pedestal and a laser scanner that was being used to scan a person and print out a miniature, plastic, 3D-action-figure portrait of the scanned person. Interestingly, 3D printers can print in a wide range of materials including plastic, some medals, ceramic type materials that can be fired and even edible substances. (The article I read about printed food didn’t sound too appetizing). While this blog post is focused on mentioning the new dimension of intellectual property infringement (including copyright, trademark and patent) that is possible with 3D printing, there are countless other possibilities available with 3D printing. In fact, you may have read that Philadelphia has just become the first city in the US to ban the use of 3D printers to manufacture firearms. 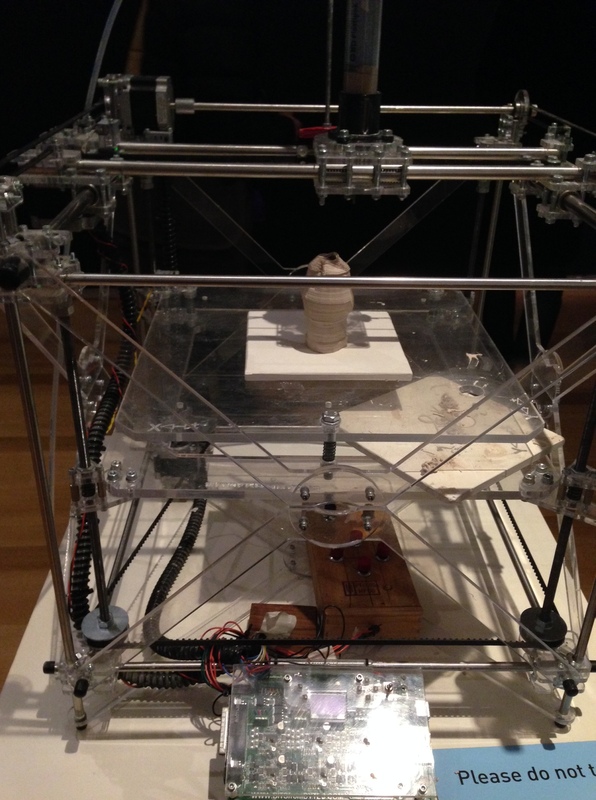 On a more positive note, artists and engineers are designing and printing fascinating new works. The Out of Hand exhibit at the Museum of Art and Design features some of these creative new works. For more information, see also, Makerbot printers at www.makerbot.com; Shapeways 3D printing marketplace and community at www.shapeways.com; the Out of Hand exhibit at the Museum of Art and Design featuring artistic uses of 3D printing at http://madmuseum.org/exhibition/out-hand; news about Philadelphia’s ban at www.forbes.com/sites/timworstall/2013/11/25/how-cute-philadelphia-passes-law-banning-3d-gun-printing; @iplegalfreebies and www.kasterlegal.com. 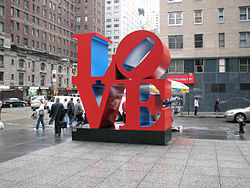 Have you read that the American Pop Artist Robert Indiana (famous for his “LOVE” with a tilted O) will be featured in a new exhibition at the Whitney Museum in NYC? Have you also read that he missed out on controlling all the rights to his famous “LOVE” work because he didn’t copyright it properly? This is an important reminder to artists and creative folks to copyright your work! For a work to be eligible for copyright registration it must be original and “fixed in a tangible form.” This can include any original work, fixed in virtually any tangible form. For example, original copyrightable works can include: sculptures, drawings, photographs, artwork, music, poetry, graffiti, jewelry designs, motion pictures, video clips, translations, texts, manuscripts, recordings…. etc. And the requirement that the work be “fixed in a tangible form” can include traditional mediums such as paper, canvas, clay, DVDs, CDs… and less traditional mediums such as a napkin… scrap of paper… and probably even peanut butter. See, The US Copyright Office Website at: www.copyright.gov; for more information on the upcoming exhibit of Robert Indiana’s work in NYC www.whitney.org/Exhibitions/RobertIndiana, @iplegalfreebies and www.kasterlegal.com. As a post script, I mentioned peanut butter above as a possible medium for fixing an original copyrightable work, because, there is a contemporary Double Mona Lisa work made out of PB&J – www.artnet.com/usernet/awc/awc_workdetail. This is a FOLLOW UP post regarding changes that AT&T has made to the Opt-Out process to simplify it and iron out the kinks. AT&T has acknowledged that some of its customers (including me and maybe you too) had difficulty completing the Opt-Out process on their mobile devices and as a consequence AT&T has revised the process for Opting-Out on a mobile device. I just went through these steps on my iPhone and received the promised confirmation message. Simplifying this Opt-Out process and providing a confirmation message was a good move. All AT&T customers should have received an email from AT&T giving notice of this revised Opt-Out process for mobile devices. (THANKS to all of you who contacted AT&T to let them know that you were having difficulty with the initial Opt-Out process. I have a hunch that this new revised Opt-Out was launched in response to the feedback we all provided). For more information on privacy policies see: http://wp.me/p10nNq-tf; http://wp.me/p10nNq-bL; http://wp.me/p10nNq-ni; and for more information on Opt-Out policies see: http://wp.me/p10nNq-6j ; @iplegalfreebies and www.kasterlegal.com. An enterprising PhD student from Thailand discovered that he could make a profit by reselling textbooks on eBay that were bought in Thailand and shipped to him in the U.S. It’s important to note that the textbooks being bought and shipped to the student were legitimate copies of textbooks that were being manufactured and sold in Asia at a much lower price than the same textbooks are sold here in the U.S. (hence the profit margin). The student was sued by a textbook publisher for copyright infringement and the lawsuit made its way to the U.S. Supreme Court in March 2013. THE TEXTBOOK PUBLISHER argued that copies of the textbooks that were manufactured and sold outside the U.S. could not be imported and resold here in the U.S without their permission. THE STUDENT argued that legitimate copies of the textbooks could be bought and resold freely as per the “first-sale doctrine” of the U.S. Copyright law. In March, the U.S. Supreme Court ruled for the enterprising student. Promoting free trade was the primary theme of the court’s opinion. The court held that Section 109 of the Copyright Act does not include a geographical limitation on the resale of legitimately purchased goods containing copyrighted content or materials. If permission of each and every copyright owner was needed to resell items made over-seas, free trade would be impaired. The court reiterated that the intention of the Copyright Act is to “promote the progress of science and useful arts” and is not to impair free trade nor restrict the use and resale of many lawfully purchased items. See also: KIRTSAENG v. JOHN WILEY & SONS, INC. The US Supreme Court opinion available by clicking here and at www.oyez.org; Justice Breyer delivered the opinion for the Supreme Court: www.law.cornell.edu; Copyright Act, Section 109: www.copyright.gov; @iplegalfreebies and www.kasterlegal.com. Sojourner Truth registered her historic image “I sell the shadow to support the substance” with the US Copyright Office in 1864. To me, it’s remarkable that in addition to Sojourner Truth’s famed work as an African-American abolitionist and advocate for women’s rights… she was also a copyright owner. Back in 1864 when Sojourner Truth registered her image with the US Copyright Office, the copyright laws were different than they are today… and claiming copyright protection involved more formalities. However, the basic principles of copyright protection were the same: controlling the copying, printing, reprinting and publishing of a registered work. Evidently, Sojourner Truth sold copies of her image to raise money for the abolitionist movement. (ie a good motivation to control the use, copying, printing and reprinting of the image with copyright registration). While I have always held Sojourner Truth in high regard for her historic advocacy work, I’m adding copyright owner to the list of her heroic acts. (The copyright notice on Sojourner Truth’s historic image caught my eye while visiting a recent exhibition of Civil War Photography at the Metropolitan Museum of Art). See also, www.nps.gov/wori/historyculture/sojourner-truth.htm; US Copyright Act of 1790 at www.copyright.gov/history/1790act; www.loc.gov/pictures/item/98501244/; @iplegalfreebies and www.kasterlegal.com.